GEORGETOWN, Sept. 22 (Xinhua) -- China is ready to enhance cooperation with the Caribbean Community (CARICOM) in multilateral areas in order to better safeguard the rights and interests of developing countries, Chinese State Councilor and Foreign Minister Wang Yi said here Saturday. China shares CARICOM countries' position that multilateralism should be adhered to and the free trade system be actively upheld, said Wang during his meeting with Irwin Larocque, secretary-general of CARICOM whose secretariat is based in the Guyanese capital. China attaches importance to CARICOM countries' concerns and legitimate needs regarding climate change, he said, adding that China is willing to continue to push forward the effective implementation of the Paris Agreement and to urge developed nations to fulfill their commitments. China appreciates efforts made by CARICOM countries and its secretary-general to advance the organization's cooperation with China, Wang said, adding that China is ready to make further efforts to build a community of a shared future for China and CARICOM on the basis of their comprehensive cooperative partnership. Larocque said CARICOM speaks highly of China's important influence and leadership in international affairs such as the combat against climate change, and particularly appreciates China's positive role in promoting South-South cooperation and defending the rights and interests of developing countries, including CARICOM members. 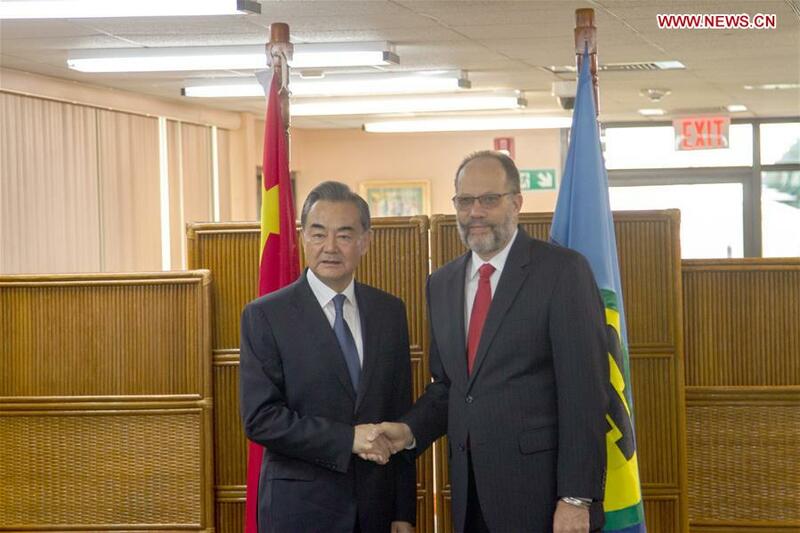 Wang's visit to the CARICOM secretariat is the first made by a Chinese foreign minister.